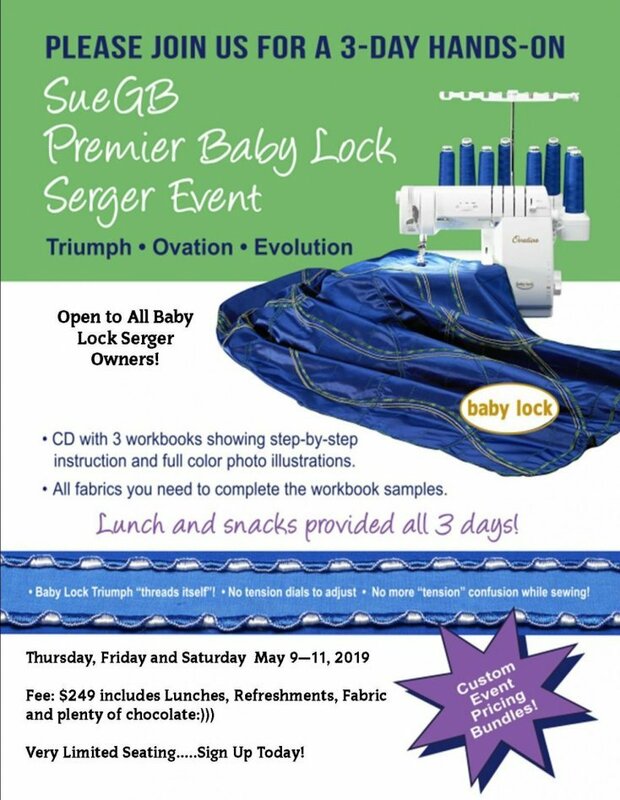 Please join us for a 3 Day Hands On Premier Baby Lock Serger Event with Sue Green Baker, one of the leading Serger Experts! This event is open to Baby Lock Serger Owners. The fee includes a CD with three workbooks, showing step-by-step instructions and full color photo illustrations, and ALL the fabric you need to complete the workbook samples!!! In addition to this, snacks and lunch is provided for all three days! Seating is extremely limited, so please SIGN UP TODAY to ensure your spot in the class!! Fee includes LUNCH, REFRESHMENTS, FABRIC & PLENTY OF CHOCOLATE!! !